Our chapter has an active conservation tradition; the chapter has furnished many of the Headquarter’s conservation leaders, all with a tradition of addressing issues with real knowledge of the topic. The chapter’s Conservation Committee works on issues and plans for the Adirondack and Catskill Forest Preserve, as well as local natural areas. Paddlers and hikers can add an environmental kick to their trips under a new program initiated by the ADK to identify water bodies and woodlands threatened by invasive species. Known formally as the Backcountry Water Monitors and Backcountry Forest Monitors projects, the work entails looking, sampling and submitting findings from ponds and lakes in the Champlain Basin – and more broadly in the woodlands of the Adirondacks – as part of a major effort by environmental organizations to combat the intrusion of destructive species such as milfoil, the spiny water flea, and the hemlock woolly adelgid. Their growing presence is due to both recreational traffic and warmer temperatures. These plants and critters pose a huge threat. One of the most high-profile activities in the public eye currently is the boat-washing on major water bodies such as Lake George, driven by a push from locals there that sparked a positive response from Gov. Andrew Cuomo and the state Department of Environmental Conservation. 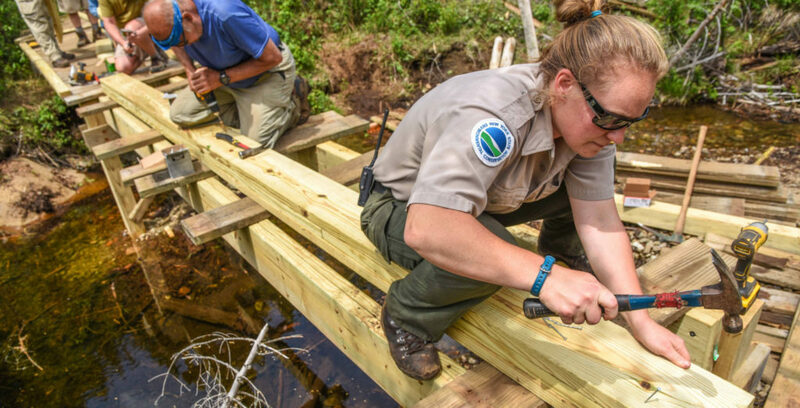 The citizen science projects now expanding are an outgrowth of this program and are intended to have more boots on the ground and paddles in the water for a broader reach, intended to study and sample small, remote areas. As published in the May-June edition of Adirondac, volunteers are being sought for training for both the aquatic and land-based invasives. For more information, please contact Cathy Pedler at 518-449-3870 or cathy@adk.org. Partners in the project include Adirondack Park Invasive Plant Program, the Adirondack Watershed Institute of Paul Smith’s College, Cornell University and the DEC.